:At the base of every broken life, every dysfunctional relationship, every bad choice is a lie we believe. And at the root of every lie is fear. Fear of not having enough, fear of missing out, fear of being alone. The good news is, once we can identify and name our fears, we can defeat the lies that control us and live out the more abundant life that Christ promises us. With sharp insight and deep compassion, Clayton King identifies the ten big lies we commonly believe, each rooted in the fear of losing something. He blows them apart, one by one, with God's truth, allowing readers to take back control of their hearts, minds, and actions. Covering such pervasive problems as loneliness, unforgiveness, shame, human suffering, self-image, sexual sin, and more, King shines a light on all those things that are holding us down and clears the way for the faith that sets us free. 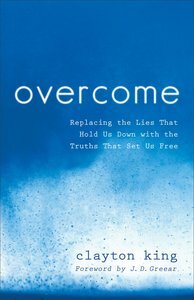 About "Overcome: Replacing the Lies That Hold Us Down With the Truths That Set Us Free"